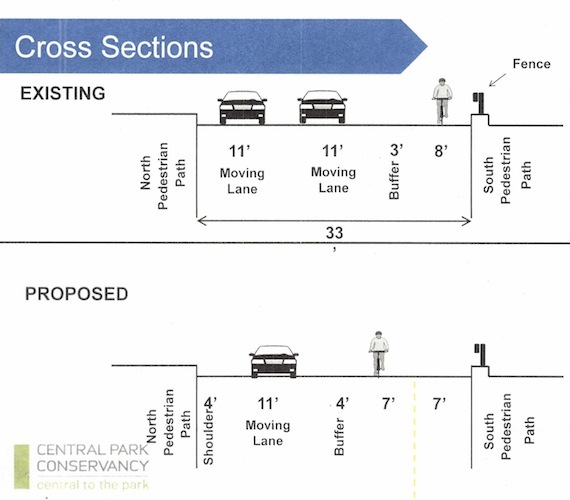 In Central Park, 72nd Street is going to have more space for bicycles and one less lane for cars come June. This summer, cyclists will have a second path to safely cross Central Park. At a meeting of CB 7’s Parks Committee last night, Central Park Conservancy President Doug Blonsky announced that the Department of Transportation will paint a new two-way bike lane along 72nd Street all the way between Central Park West and Fifth Avenue, reducing the number of motor vehicle lanes on that stretch of the park road from two to one. Unlike the new cross-park bike route near 96th Street, this one won’t be a shared path for cyclists and pedestrians, nor will it include dismount zones at either end of the park. Blonsky said the redesign should be in place by June. At the meeting last night, Blonsky said that reviews of the designated bike route along 96th Street have been positive so far, but that no additional crosstown bike paths through the park are planned until the Conservancy has more time to observe the first two, according to Coughlin. Previously, the Conservancy floated plans for additional cross-park paths at 102nd Street and 86th Street. The removal of a traffic lane from 72nd Street, which is open to cars during rush hour, marks another step in the incremental reclamation of Central Park from motor vehicles. “The fact that non-motorized transportation now has priority on a park road bodes well for a return to the true urban refuge the park’s designers envisioned and created,” said Coughlin. Last year, several community boards surrounding the park and the Manhattan Borough Board voted in favor of a summer car-free trial. In response, the Bloomberg administration apparently began to measure traffic volumes on the park road so the effect of a trial can be quantified. What about access between CPW/5th Ave and this path? Be interesting to see how this works on the East Side, where 72nd intersects the park loop drive. There is a blind corner where the 72nd transverse crosses the park’s East Drive. (West side of intersection.) Cyclists going East bound on the new two way lane are going to be emerging from that blind spot, and crossing in front of other cyclists plunging down a hill as they travel Northbound on the loop. There are also carriages and joggers heading Northbound at that intersection, which is also where cars are diverted during car-free hours. People will really have to pay attention here. Looks good in theory. Of course the real challenge will be to keep runners out who will, most likely, presume it’s a two way jogging track. Trucks and buses can function in 10′ wide lanes with a speed limit of 30mph. Central Park allows only cars, no trucks and buses, and has a speed limit of 25mph. That vehicle moving lane should be 10′ or less in the new design, not 11′. Also, giving the motorists a 4′ shoulder next to their lane basically gives them a 15′ wide lane. There should be no shoulder, one 10′ moving lane next to the curb, and then the bike lane can be 9.5″ in each direction. This would help because in reality the bike lane will be filled with pedestrians and joggers who do not use the space designated for them, so the bike lane needs to be oversized to accomodate them. Or the bike lane could be 7′ in each direction as planned and a 5′ pedestrian lane could be added (be re-allocating the 4′ shoulder and reducing the 11′ lane to 10′) since pedestrians like the use the road and do not stick to their path on the other side of the fence. Reducing the vehicle travel lanes from two to one is fantastic, but the extra space could have been re-allocated much better that this design. @88b32fb69e499718d95067da9d3d7b03:disqus Trucks and busses may function in 10′ wide lanes @ 30 mph when they aren’t sharing the road with pedestrians, cyclists and horse drawn carriages.Giving them the extra foot is a small safety measure in a park that’s already beyond capacity in terms of pedestrian traffic. A better idea might be to eliminate motor vehicle traffic entirely from Bethesda Terrace since cars already have the 66th Street and 79th street transverses. To Mike’s question, access to and from Fifth will be along the north side of the entrance road. Access to CPW will be on either side of the existing roadway (those heading west to the right, those heading east or south to the left, if you’re facing west). The potentially dangerous conflicts with cyclists and cars going down the hill on the East Drive were raised at the committee meeting. There will be traffic lights both for those crossing and those heading north down the hill. There will also be pavement markings to signal to cyclists that they are coming to a potentially dangerous intersection. I remain concerned about that intersection. Daphna makes an excellent point that I will pass on to the powers that be. To Stacy Rosenstock, Giving motorists a wider lane does not help them to take greater care when they are surrounded by pedestrians, horses, bikes, etc. On the contrary, the more narrow a lane, the greater care a motorist is forced to take by virtue of the road design. An 11′ foot lane with a 5′ shoulder on one side and a 4′ buffer on the other will encourage speeding by motorists. Anytime a lane a lane is wider than needed to accomodate the speed limit, then that promotes speeding. The vehicle moving lane should be against the curb so there is a physical barrier that drivers will not want to hit (for fear of damaging their vehicle), and the lane should be narrow. Excess width of the lane does not lead to enhanced safety for bike/ped/horses, it just leads to speeding by drivers. I second both daphna’s posts- great points. I never considered bells on bikes useful until I rode in Amsterdam and Copenhagen. Since we have to carry bells and if we all keep ringing them at peds in the bike lane, they will learn. It is a very polite way to publicly shame someone. I understand the various concerns here but folks should recognize that in practice this is already a two-way bike lane….. Thank you Ken Coughlin for representing us park-loving New Yorkers so well! The success of this will depend on the runners who generally disregard the lane markings and occupy both the running and cycling lanes throughout the park. It would be helpful if the New York Road Runners could encourage their members to “mind their lanes.” They are a powerful group. If their members lead by example, others will likely follow. Since I both run and bike in the park, I can sympathize with both groups. The truth is that there is not enough space for everyone to stay on their designated lanes. Runners run on the bike lane because the pedestrian lane has people walking or strolling, making it hard to run. Cyclists also have a very wide range of speeds, and there’s not a lot of room to pass. Just get rid of the car lanes and there will be enough room for park users. That said, instead of reducing the number of car lanes from 2 to 1, they should stick 2 bus lanes, one in each direction, in the same space. No cars, only buses. The M72 currently has to detour through 66th Street, and this makes it too slow. A bus-only lane would make it a relatively fast crosstown bus: 72nd is already less jammed in my experience than 79th and the other major Uptown cross streets, since it doesn’t go all the way through the park, and letting buses go through the park would not change that. Of course 72nd is not going to connect subway stops at both ends like 86th and 96th, but it could offer a better alternative to the M79 and M66, especially after SAS Phase 1 opens. Hopefully joggers will feel most comfortable in the car lanes durring cart free hours. Can one of the joggers explain to me why joggers don’t like the foot paths? are they poorly lit? Several runners have told me that they won’t use the designated running lane on the Central Park Loop because in places it is at a grade, which can cause ankle strain. So they take the bike lane, which is more level. Forcing cyclists to ride in MV traffic, which has also been known to lead to injury. The Central Park Conservancy, which has to serve the needs of many, sometime competing park users, deserves special thanks for their persistence and careful planning throughout this process. Thanks to them, Parks Commissioner Benepe, and NYC-DOT for making this badly-needed improvement. This is terrific news. I still wonder about the egress when riding from west to east, requiring crossing uptown bike riders as well as exiting uptown cars – a very dangerous spot. Rode across 72nd street this morning – work has started on this project. It should be done before the end of June! I understand Daphna’s points, but hopefully with only one lane there will be enough traffic that people will be forced to drive slowly just because of the vehicular congestion. Wow! That’s great! I am so excited for that trail by bell – 72 avenue! It’s going to be awesome! I just bought myself a new bike for Christmas and I can’t wait until it’s warm enough to whip it out! Great news! Thanks. I’ve seen a lot of information on here that deals a lot with bell – 72 avenue. Can you tell me more about it?